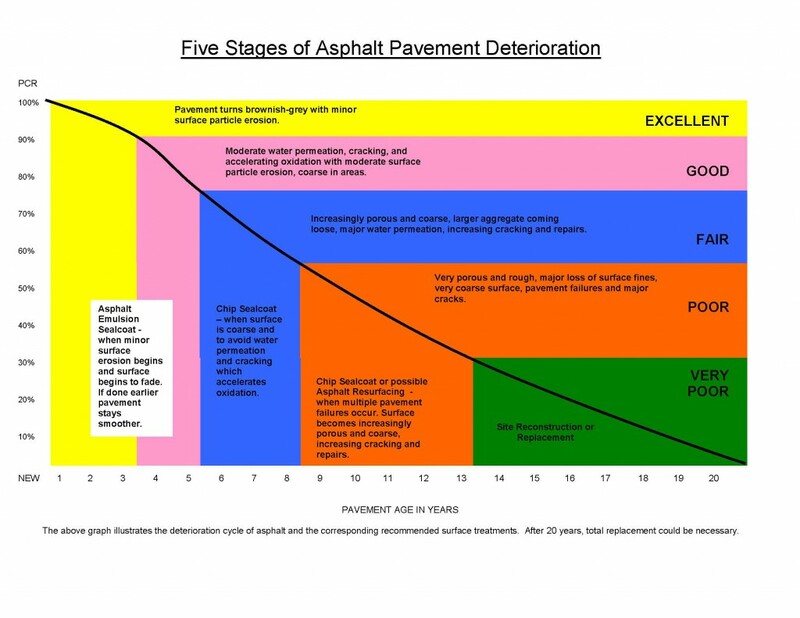 There is no exact formula in how long your asphalt pavement is going to last. It comes down to many factors such as freeze-thaw cycles (how bad was the winter season), weather patterns (did you need to salt a lot in the winter, was there excess heat or sunlight over the summer), drainage conditions in your lot (are the catch basins or storm drains functioning properly), and also the soil condition underneath your asphalt. When minor surface erosion begins and surface begins to fade. If done earlier pavement stays smoother. When surface is course and to avoid water permeation and cracking with accelerates oxidation. When multiple pavement failures occur. Surface becomes increasingly porous and coarse, increasing cracking and repairs.